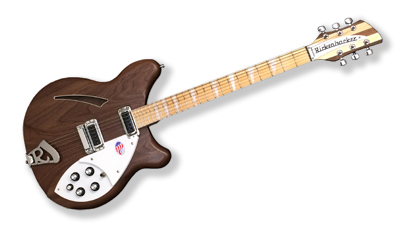 The W Series version of the guitar that broke all the styling rules of the 1960's now boasts a solid natural look to accompany the full, rich and warm sounds distinctive to Rickenbackers. Subtly updated through the years, this Deluxe hollow body with its special contour around the entire body perimeter, is still perhaps the most comfortable guitar of all. The bound body and Maple fingerboard, inlayed with triangular pearloid markers, provide an exceptionally attractive appearance. Stereo output is standard.